Did you know that there’s something going on at the historic Sunnybrook Ballroom every weekend? And that the weekend actually begins on Thursday night?? Check out the events below, then make your plans to be there! Have a blast singing your favorite tunes. Be a rock star at Chummy’s. Drink Specials and plenty of fun! Every Sunday at 10:30 am. Mark your calendar and make your reservations now! The Bridal Expo returns to Sunnybrook on February 26th, 1 pm to 4 pm. Check the website for more info and vendor details. Yesterday I had the chance to catch up with Dave Devlin, Program Director for The Buzz, WBZH 1370 AM. The Buzz is the Pottstown area’s only local radio station and it’s poised to launch Phase 3 of their plan to bring back and expand community radio in a big way for the tri-county region. Phase 1 involved getting the station back on the air just over a year ago, after 1370 went silent for about a year. Phase 2 involved a name and identity change from WPAZ to WBZH, The Buzz. And now, Phase 3 – which I actually can’t specify just yet! – will soon position the station to serve the community in a way that’s totally unique for a radio/TV station anywhere. On February 7th The Buzz will hold a press conference, including local bloggers, to announce their new campaign, and on February 9th it will swing into action. Stay tuned here and online at wbzh.net or on the radio at 1370 AM. Catch The Buzz! Looking for a way to kick off the New Year by learning something new, or with an evening full of surprises, fun and creativity? Join the excitement at the Tri-County Performing Arts Center, 245 E. High Street, Pottstown, as the exciting winter session of classes are unveiled and the N Crowd provides an evening of fast-paced improvisational theater! The fun begins with an OPEN HOUSE on Saturday, January 7th from 11 AM until 5 PM. Then visit one of Pottstown’s eateries and come back to the theater for a performance of the N Crowd at 8 PM! Can’t make it Saturday? The Educational OPEN HOUSE will continue on Sunday from 11 AM until 5 PM. The N Crowd is a professional short form improvisational troupe that has been performing weekly inPhiladelphiasince 2005. Performers include Pottstown’s own BJ Ellis! At each show, the N-Crowd plays a series of games and scenes based on suggestions from the audience. There are no scripts, no props, and nowhere to run! The N Crowd was selected by Fox 29’s Hot List as the Best Comedy Club in Philadelphia in 2008 and finished 2nd place in the same category in 2009. Currently, they perform at the Actors Center in Philadelphia. The audience is an important part of the show, providing the suggestions and cheering the cast on as they tackle a variety of topics. Be a part of the fun TODAY, Saturday, January 7th at 8 PM. Tickets are $17 for adults, $15 for students and seniors, and $13 for children 12 and under. Parental guidance is suggested for this show. Tickets may be purchased at www.tripac.org, or at the door the night of the show if available. As always, there are discounts for groups of 10 or more. At the Education Open House you can register for Group Classes and Private Lessons for ages 3 through senior citizens. Group classes include acting, comedy improv, scene study, audition techniques, music, voice, storybook character play and age-based performance troupes. Private instruction includes acting, voice, piano, guitar, flute, music therapy, and monologue coaching. 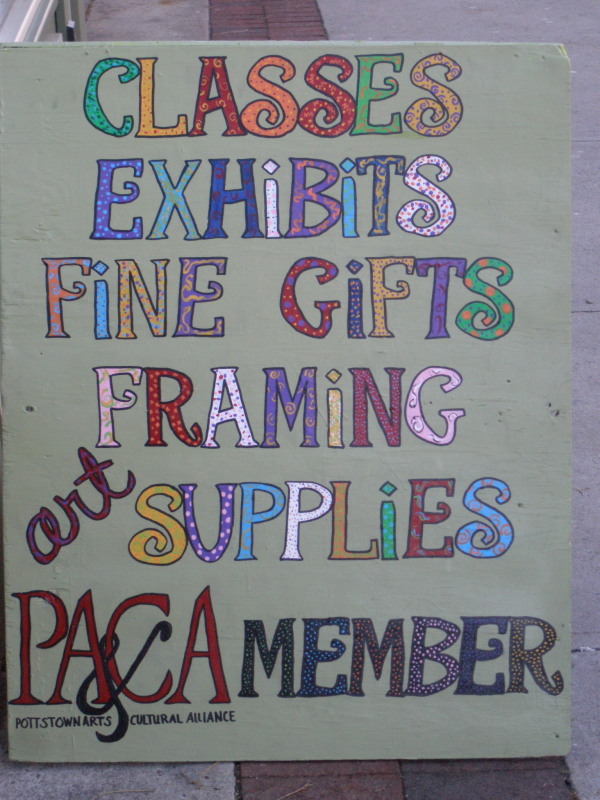 Check the website, www.tripac.org, for full class descriptions and times. Get ready for a great Winter season with the N Crowd, “Goldilocks”, “Ain’t Misbehavin”, “Toys In The Attic”, “Farragut North”, performances by the Melange Contemporary Dance Company and the Senior Follies, all leading up to a great musical in June. There’s something for everyone at the Tri-County Performing Arts Center! Village Productions is a dynamic performing arts organization founded in 2001 by a dedicated team of performing artists, arts educators, and area residents who dreamed of creating new and highly accessible performing arts opportunities for the community. Village Productions seeks to strengthen community, inspire creative exploration, educate, and entertain, through the presentation of quality performing arts events and educational opportunities geared toward a diverse audience. You may contact Village Productions through their website at www.tripac.org, or by telephone at 610-970-1199. Still shopping? Unique gifts can be found in downtown Pottstown. Procrastinator that I am, I got a huge amount of shopping done on just a couple of blocks of High Street yesterday afternoon. The Gallery on High… Weitzenkorn’s… Fine Wine & Good Spirits… and The Farmers’ Market. 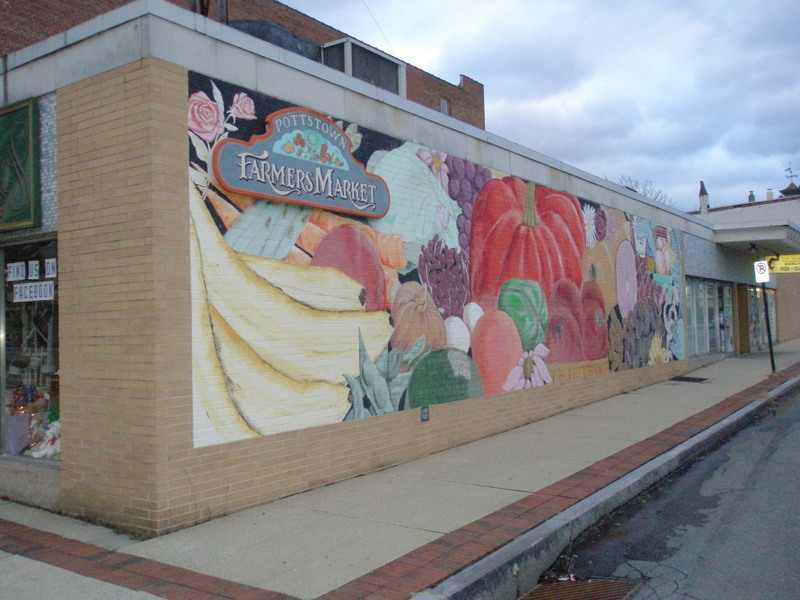 Yes, the Farmers’ Market vendors have gift certificates so you can give the gift of fresh, local food. Stop in to see Grumpy’s Sandwiches, Freeland Market, J&H Produce, Mosteller’s Seafood, Wegman’s Deli, and Pottstown Florist. You might want to wind up your shopping at Weitzenkorn’s; they were serving wine and cheese and they provide free gift wrapping. They’ve got a beautiful selection, knowledgeable and friendly service, and some items were reduced 40%! There are many other shopping options throughout town… Company Cakes on Charlotte Street, gift certificates to restaurants like Henry’s, Funky Lil Kitchen, the Brickhouse, and Juan Carlos Fine Mexican. How about a gift certificate from Belle Rouge or Emilie’s or something special for that special someone from Jean’s Lingerie? And don’t forget The Milkman Lunch Company & Cake Shoppe, tickets to the Tri-PAC, or lessons from High Street Music Company and The Ballroom on High! Don’t forget to check out the websites and give a call to confirm hours today, Christmas Eve! “Frosty The Snowman” will be performed by the middle school clarinet ensemble. Christmas favorites such as “All I Want for Christmas Is My Two Front Teeth” and “O Tannebaum” will be featured by the sixth grade band. The newly organized High School Rock Quartet will perform “My Favorite Things.” The high school clarinet ensemble will be featured with their “Up On the Rooftop” presentation. The entire community is invited to kickoff the holiday season during this evening of fun and entertainment! 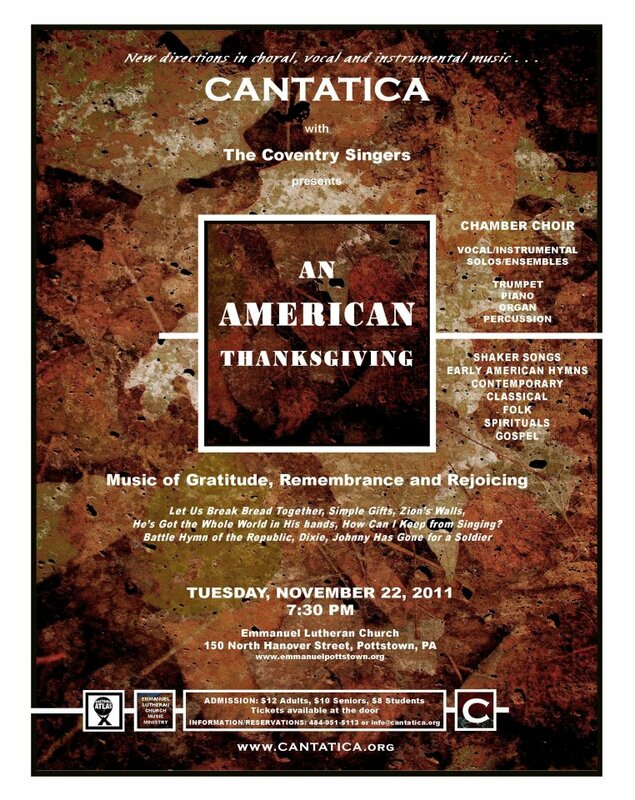 This Tuesday, November 22nd at 7:30 pm, the professional chamber ensemble and artist-in-residence Cantatica will present music of gratitude, remembrance and rejoicing at Emmanuel Evangelical Lutheran Church. Please note that the Coventry Singers will also be guest artists. The concert will include Let Us Break Bread Together, Simple Gifts, Zion’s Walls, He’s Got the Whole World in His Hands, How Can I Keep From Singing, Battle Hymn of the Republic, Dixie, and Johnny Has Gone For a Soldier. Emmanuel Lutheran offers a free Music at Emmanuel series throughout the year. Check out their Facebook page here. Their next concert features the Reading Choral Society in “A Celebration of Light” on Sunday, December 11.